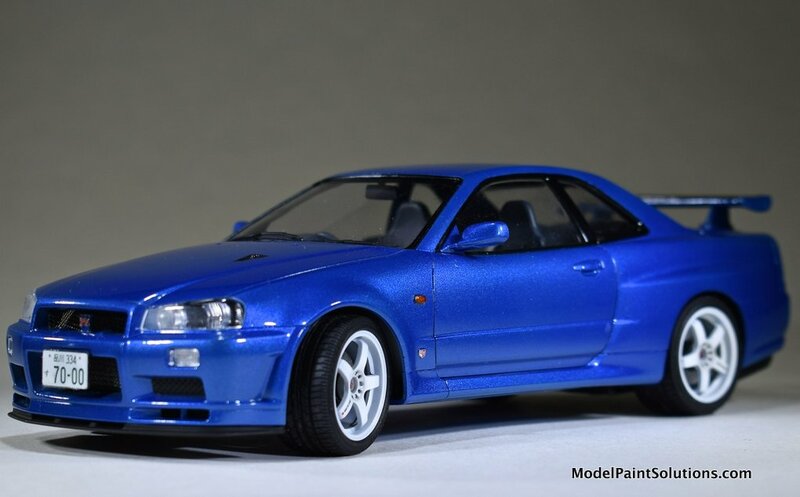 The Nissan Skyline (Japanese: Sukairain) is a line of compact cars, sports cars, and compact executive cars originally produced by the Prince Motor Company starting in 1957, and then by Nissan after the two companies merged in 1967. After the merger, the Skyline and its larger counterpart, the Nissan Gloria, were sold in Japan at dealership sales channels called Nissan Prince Shops. 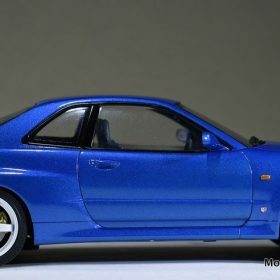 The Skyline was largely designed and engineered by Shinichiro Sakurai from inception, and he remained a chief influence of the car until his death in 2011. Skylines are available in either coupe, or sedan body styles, plus station wagon, crossover, convertible and pickup/sedan delivery body styles. The later models are most commonly known by their trademark round brake and tail lights (as of 1972). 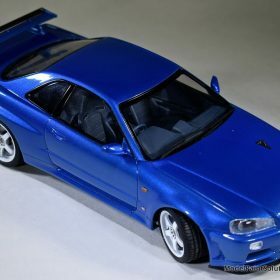 While not distributed in the United States until its importation as the Infiniti G, the Skyline’s prominence in video games, movies and magazines resulted in many such cars being imported there from 1989 to late 2005. 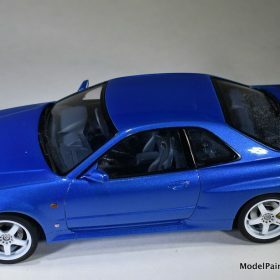 The majority of Skyline models are rear-wheel drive, with four-wheel drive being available since the eighth-generation’s debut. 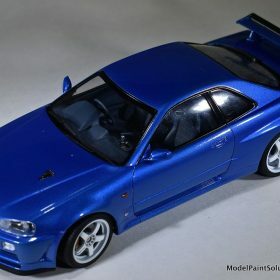 The 11th-generation Skyline (V35) was another major turning point for the nameplate, as it dropped some of the previous generation Skyline’s trademark characteristics such as the straight-6 engine (replaced with a V6) and turbocharging, and eventually separated the GT-R into its own line. Nissan decided to retain the Skyline for the luxury-sport market, while its platform-mate, the 350Z, revived the Z line of pure sports cars. The V35 was the first Skyline made for export to North America, being sold under Nissan’s luxury marque Infiniti as the G35. The Skyline (V36/J50) is sold in Europe, North America, South Korea, Taiwan, and the Middle East as the Infiniti G3. 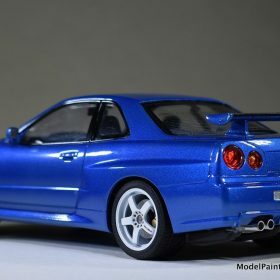 On April 12, 2010 a Guinness Book of Records event took place with 225 Skylines taking part in a parade lap at the ISTS at Silverstone UK, which produced two world records: the most recorded Nissan Skylines at one meet at one time, and Most Nissan Skylines on a track at the same time. In May 1998, the HR34, ER34, ENR34, and BNR34 marked the introduction of the more fuel-efficient and environmentally friendly RB25DET NEO engine. 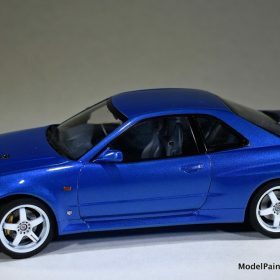 The RB20E engine was discontinued in the R34 base model (GT), and the RB20DE, after last being used in the R32 Skyline, was reintroduced in the updated NEO guise. 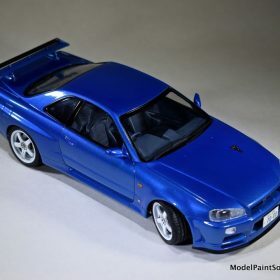 The R34 GT, powered by the RB20DE NEO and coupled with a five-speed gearbox, became the most fuel-efficient straight-six Skyline to date (of any shape). The 4-speed automatic transmission available on some models was retained, and was upgraded with tiptronic-style manual controls. The 25GT Turbo coupe variant (often abbreviated as GT-T) was sold in Singapore, New Zealand and Hong Kong from 1998 to 2000 respectively. 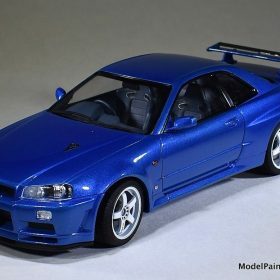 They were the only three countries besides Japan that sold the R34 25GT Turbo model Skylines new. 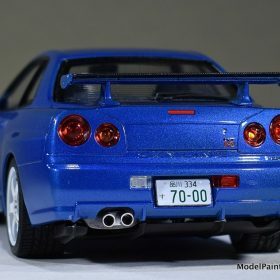 All Japanese Nissan Prince Store locations that sold the Skyline were renamed Nissan Red Stage. Nissan introduced two new models for the base vehicle, the 25GT-X and the 25GT-V. The 25GT-X was only available as a sedan and included optional extras over the 25GT and 25GT Turbo such as tinted rear windows and pop-up LCD display that replaced the triple cluster on the turbo models. 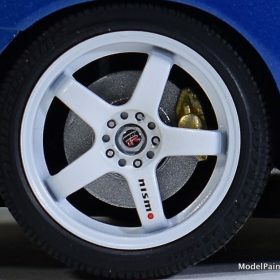 The 25GT-V was a naturally-aspirated variation that came standard with the upgraded 4-piston front and 2-piston rear Sumitomo calipers and 17″ wheels only found on the turbo models. 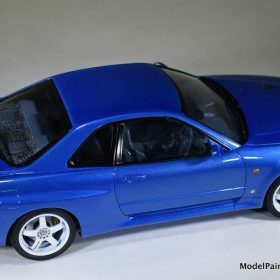 In August 2000, the R34 received a facelift which changed the front bumper to a new, sleek design and Xenon headlights were optional across the entire range. For the interior, pedals were changed from rubber to aluminium and the steering wheel and gear shift knob were now made of genuine leather. The center console and dials now had an iridium-silver appearance. 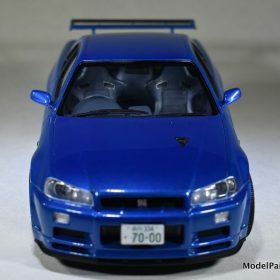 Optional extras for the R34 included exterior aero which consists of redesigned front and rear bumpers, side skirts and a wrap-around spoiler on the rear which was only available for the coupe. 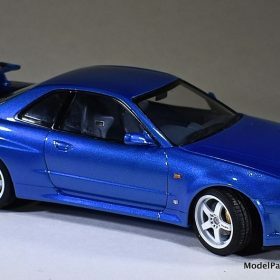 Optional tuning NISMO parts for the R34 included shock absorbers, exhaust system, intercooler, sway bars, oil cooler, and limited slip differential. 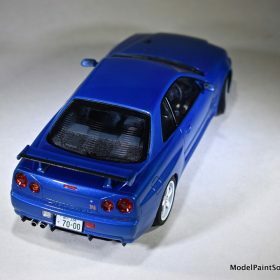 Being a Tamiya kit, the parts are cleanly molded and devoid of flash. All parts were removed with Gundam Planet Model Nippers (GodHand) and cleaned up with a new X-Acto blade. Additional clean up was done with Alpha Abrasives synthetic sandpaper. Micromesh was used to remove mold seams. 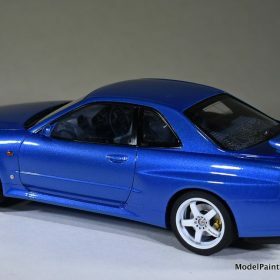 The model was assembled with CA (Bob Smith), Tamiya Extra Thin, and Micro Scale Clear glues. 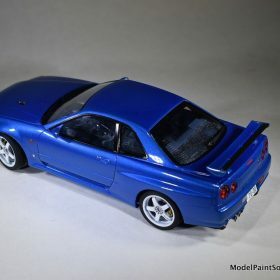 After market additions included Scale Production carbon fiber for spoiler and hood scoop and metal logos (HobbyDesign) were used to replace the kit decals. The model was primed with Stynylrez (Grey) shot neat (straight from the bottle) at 35psi an H&S Evolution. Primary paint was by Gravity Colors (Bayside Blue). This was sprayed neat at 15psi with an H&S Infinity. MRP was used for the interior parts. This was sprayed neat at 10psi with an H&S Infinity. After a few days to dry, the model was shot with 2k Clear by Gravity. This was allowed to cure for four days then it was lightly sanded and buffed out to remove a slight orange peel finish. The kits decals were used and responded well to Micro-Sol and –Set. Solvaset was used to settle the decals on the carbon fiber surfaces. 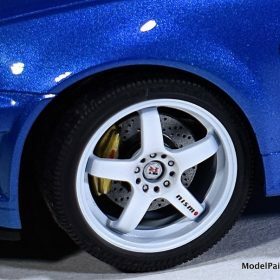 To blend in the final finish, the model was buffed and polished out with Gravity Colors polishing compounds.